The great news is that impressions made by the Huawei Ascend P1 and Ascend P1 S based on their specs sheets, still stood after we got a chance to play with them. The two ultra-slim droids are really solidly built and those 4.3″ Super AMOLED screens of qHD resolution are every bit as impressive as they sound. Then there’s the Android 4.0 Ice Cream Sandwich, which feels right at home on the Ascend P1 and P1 S. The TI OMAP 4460 chipset makes sure there are no performance hiccups at all and the two Huawei smartphones feel lightning fast. The only thing that we didn’t particularly love about the Huawei Ascend P1 and Ascend P1 S were the glossy plastic used on their bodies. It was a real fingerprint magnet, so it will probably be a lot of effort for those two to retain their great looks. Of course, we couldn’t help but notice the resemblance between these two and the Galaxy S II. 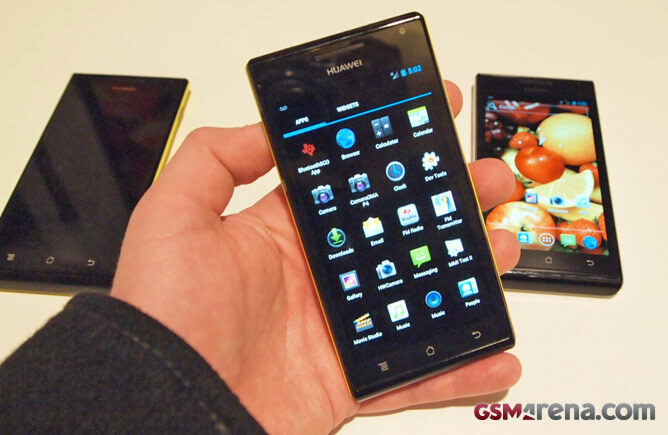 Yet, the Huawei smartphones are even slimmer than the former Samsung flagship, so they feel even nicer to handle. If Huawei get the pricing right and put enough effort into marketing the Ascend P1 and P1 S well, they might have a couple of real winners on their hands here.